Signature Arts, Inc.: Another James Spence Mistake! Has anyone seen the latest item for sale in American Memorabilia’s Auction? This outfit who has a long history of selling items mis-authenticated by 3rd party authenticators has what they describe as a “1948 Leaf - Jack Johnson Signed card #17”. Opening bid $200.00. 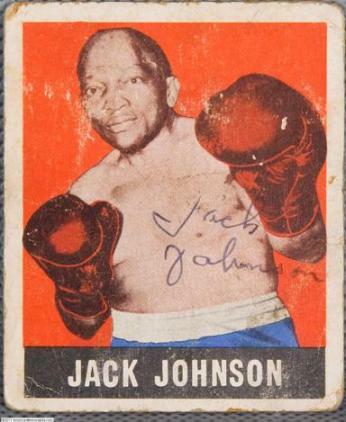 A genuine signature of Jack Johnson is quite uncommon. According to several genuine autograph experts, the signature on this card is a very poor quality forgery and no respected authenticator would ever attach their name to it. Yet, this poor quality forgery passes muster by James Spence. This item has been authenticated as genuine by James Spence at JSA Authentication. Once again, how could this happen? How in the world was any research done on this signature by James Spence to pass this horrible forgery as genuine? Again, we ask James Spence to come forward and tell us what he did to determine this signature of Jack Johnson is genuine? What did he do time wise for the money he was paid to authenticate this item? Where in the world did he find even one exemplar to make such a horrible guess? What credentials does James Spence have to be an autograph authenticator? 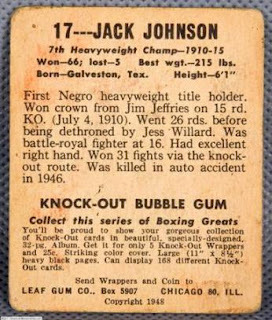 No matter what James Spence has to say to even attempt to justify his latest blunder, may we also state that Jack Johnson died on June 10, 1946, two years before this card was produced! The following is an email we received recently. It is like so many others we have received.